HI, My name is Anna. I am ... well, old enough that I don't want to say. let's just say I have a teenage daughter and be done with it. I live in suburban Virginia, near Washington DC. 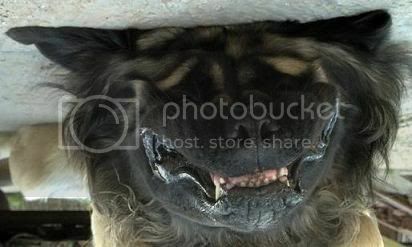 My Mastiff is Bogatyr' --which is a Russian word meaning "mighty warior". He's only 10 months old at this time, but of course already huge. He is not my first mastiff.. when I was a teen we had two that we showed. I loved the breed so much that when I finally felt able to manage a large dog (after my Rottie passed away), I decided to do what I always wanted an get a Mastiff. this one is now show quality by any means, but hey, we love him anyway. 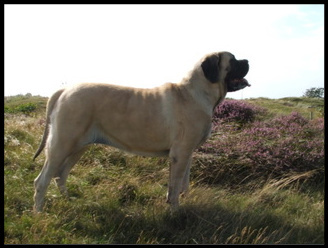 I do hope to show again one day, with another dog, but for now we just love having a Mastiff in the family again. His best friend/brother is a 5 year old Boston Terrier, who can't quite belive the little baby we brought home last fall is now big enough to fit his whole head in his mouth. Hello, my name is Kathleen. I am a new member to your very nice community. 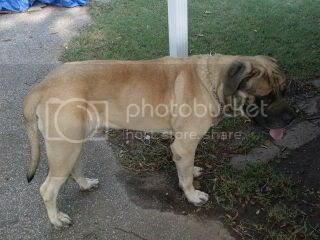 I have a Mastiff name Maximus. He is unbelievably awesome. He is now10 months old but no small guy. I have always loved big dogs and always wanted a Mastiff. My friends think I am crazy but I have 3 Great Danes(2 rescue), 1 mastiff, 1 boxer I inherited when my father passed away and a little Jack Russel Terrier. 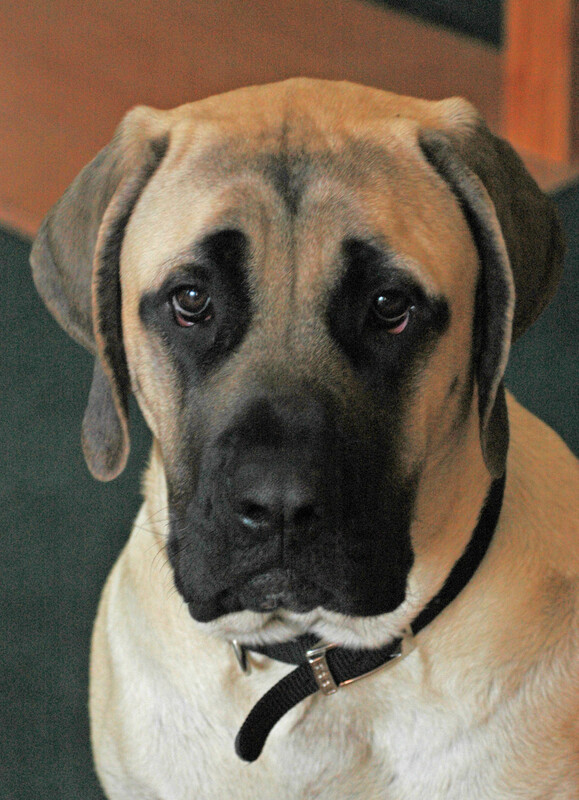 Maximus my mastiff is the love of my life, other than my husband and of course my horse. I love them all but Maximus is my favorite. He has the sweetest personality of all my dogs. We live in the country, own many horses, dogs and cats. What attracted me to the Mastiff breed was my daughter boyfriend. His father passed away and he owned a mastiff, and his mother had to move, and since he was going away to college, his mom could not keep their Mastiff and Boston terrier. She found a friend to take the Boston terrier, but no one wanted the Mastiff. So her boyfriend came over, asked me if I would consider taking Mexico( what his name was) and he would bring him over to meet me. Now I am very use to big dogs, but this dog walked in and put his face in my face, sat down and made a grrrrr ruff. I was like.......ahhhh, Matt(daughter boyfriend) and truthfully kind of scared until he said, "oh he just wants you to pet him." I did and he just put his head on my lap, and I fell in LOVE instantly and he became my dog. I was blessed to have Mexico for 3 years. He was 5 years old when he collapse and had a seizure and couldn't hardly walk. It was quite hard for me to load a 250 lb mastiff into my truck, but luckily my husband was on the farm and I got him home and we rushed him to emergency vet. He had heart problems and they couldn't do anything for him. I tear up thinking of that day. He had another seizure while we were there and they said we should put him down, we didn't want him to suffer. I cried for days. One day my husband and daughter and I were coming back from being out, and we saw a sign saying puppy expo, which had only akc breeds. My daughter, who is college age, begged me to check it out, and she wanted to buy a toy for Rex our boxer. I had my mind that I was not buying NOTHING. Right.... We walked in and what was staring at me? Maximus. I had a tear, and I picked him up, he licked me, snuggled on my shoulder under my hair and my heart MELTED. My husband walked up to me and all he said was,' Do you think he will like this toy". He said the moment he saw him, and then looked at my eye with one tear drop on my face, he brought him. I love that man. Anyway, This is the beginning trail for me and Maximus. He camps with me, he goes everywhere with me and loves kids and people, and I have NEVER ever had such a good dog or best friend. Now that is my story. Sorry long post. I was inspired by all the love everyone has for this breed. I will post a picture of Mexico, the dog that won my heart. I am still getting use to this site, so hopefully I did this right. Hi I finally decided to come out of the woodwork (I have been lurking on here for awhile ). 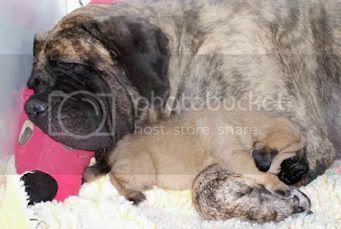 My name is Gemini, and I live in Ca,and I love mastiffs! Some of you I already know(Hi), and others it will be great getting to know you. Well, this is the first time I've ever been on this forum and I found it quite informative. My Scooby is 3 1/2 years old and just recently started bleeding on his elbows. I wasn't sure what to do so I search online and found this forum. Thanks! I look forward to getting to know everyone on here. Gemini, I have to admit I have been lurking also, afraid to talk. lol . 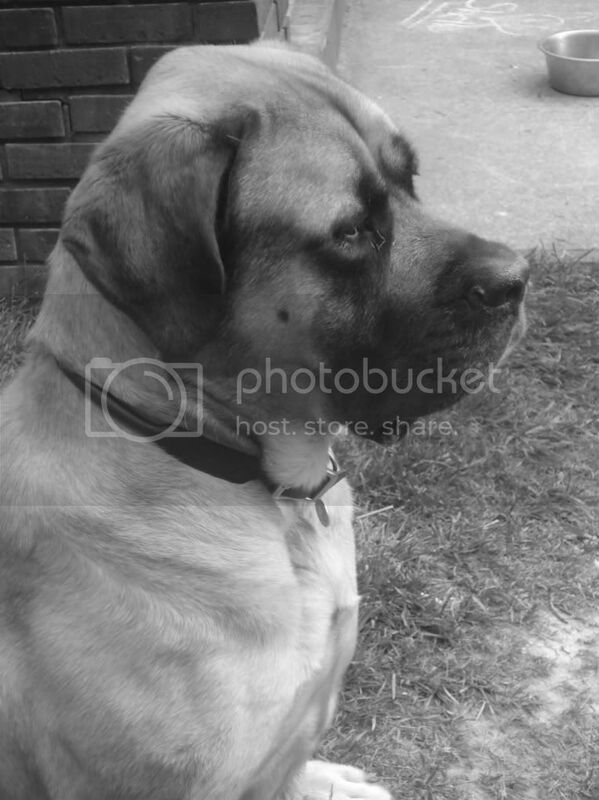 Like Scoobysmom (hello Diane), I am looking for more information about the mastiff breed, since i have one, I want to do the very best for him. I want to find out as much information as I can, and what better way to do that than to talk to other owners. Very special breed for sure. I decided to come out of the closet and start posting. My name is Lynai, same as my username, it makes it easier on my brain. I live in MN, my husband and I have five boys (9-24yrs), two grandkids between us. 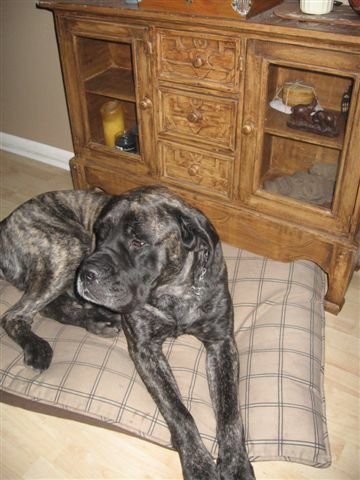 I have my huggable mastiffs, Xia (my avatar), Enoch and Sadie. 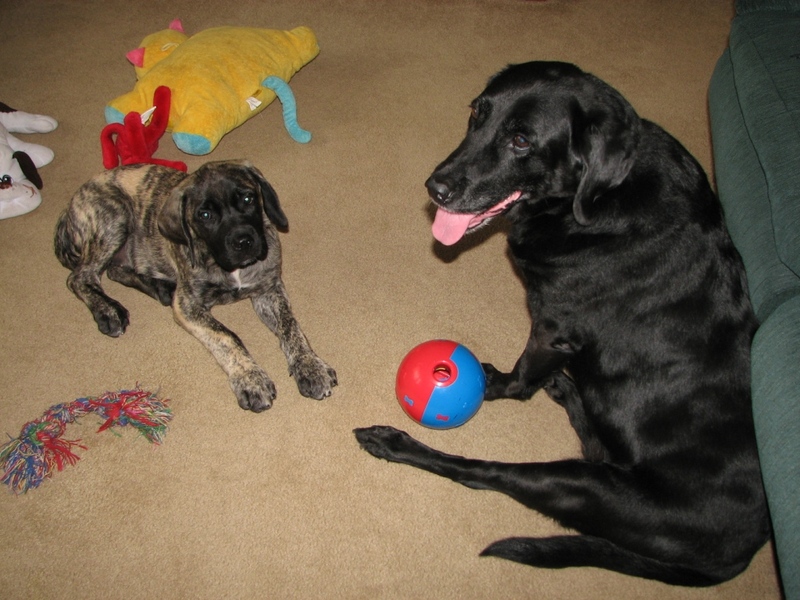 I have had mastiffs for 16yrs now, I don't imagine there will be anytime in the future that I will be without them. Look forward to actually participating in this forum. My name is Terea and I am a stay at home mom. 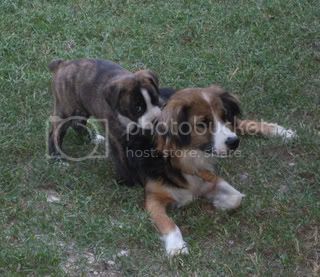 In college I joked that my dream job would be to have a baby/puppy ranch. Well, my dreams are fast coming true. 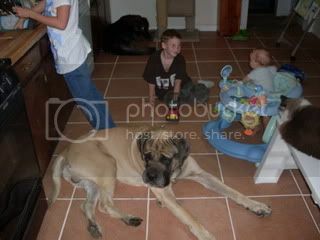 I have two children and four mastiffs...and a husband (don't want to leave him out). My daughter Kalyn is 4, and my son Grant is 3. I also have a 6 year old female called Lady, a 5 year old male Brutus, and a 7 month old female Tessie. I raised them all from puppies and I have had many beautiful litters from Lady and Brutus as well as my old Sweetheart who is no longer with us. I don't sell to puppy mills, and my ambition has never been to run a kennel. I just have some beautiful dogs and when the time feels right I welcome a litter. Just a couple of days ago I adopted a 2 year old male called Tank. 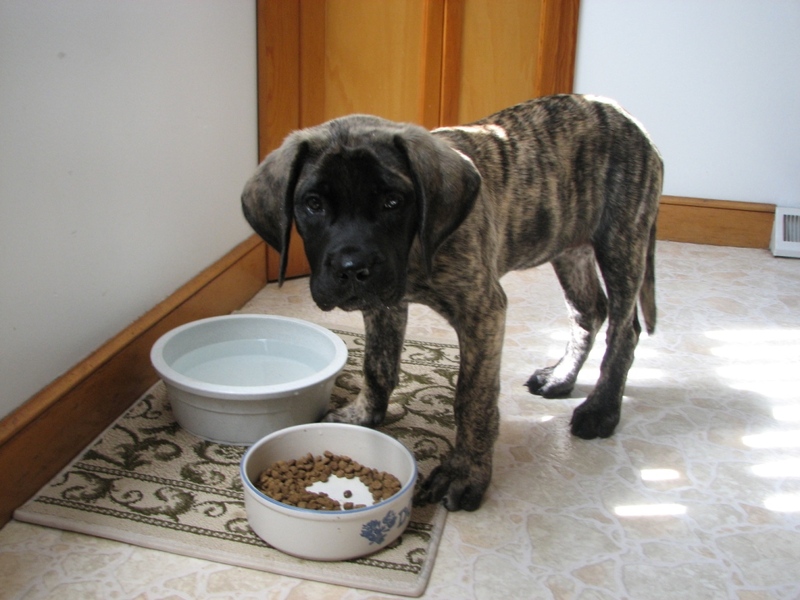 He was the puppy of Brutus and Sweetheart, but he was 8 weeks old when I last saw him. His family moved and couldn't keep him anymore and he is a bit scared, but we are looking forward to becoming friends again. We need some help making Tank feel comfortable in our home and I would appreciate any advice. I have posted a new topic: Fear/Aggression in Newly Adopted Male. It is evident that there are some very knowledgeable people on this site and I am excited to hear what you have to say. Thanks in advance. my name is Henny, we have since 2 years a mastiff female, her name is Ice -tea. She lives with us and our 3 children and 7 years old Bordeauxdog Levi. She is very pretty girl and likes walking here on the beach and in the dunes. She likes every people and all dogs. In house her favorite is sleeping at the sofa and snorring. Hey ICE-TEA eh Henny I mean. There is lots to read here. You will love this Forum,have a great time here!!! Hi, my name is Shawna. I live on 5 acres just outside of Haven, Kansas. All of my children are grown, but most still live in town just a mile or so from me. Two of my grandchildren are close enough to visit me everyday. 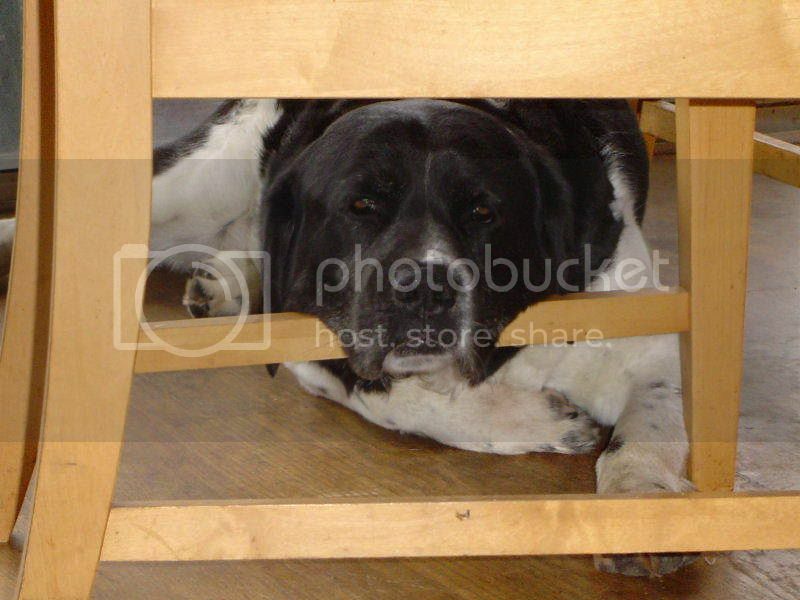 I have been lurking on this board since the closing of Mastiffweb, which I also lurked on for a short time. I am on a couple of other boards, and some of those members are here, so I thought I would join! I am also gentlegiant on Jann's board, and I'm havensbane on MOC. I got my first mastiff just over 4 years ago, and I have fallen head over heals in love with this breed. I now have 4 mastiffs...Bane 4 yrs., Baron almost 3, Faith 10 (a rescue) and Holly 4 1/2 months also a rescue. I have enjoyed attending the last three National Specialty's, and meeting lots of people there. Faith, my rescue, is featured in the MCOA Journal, the 2008 #1 edition. Along with my wonderful mastiffs, I have 2 horses, an african grey parrot, 5 cats, and I babysit my sons basset hound everyday while he is at work. Welcome to the Forum! What great people we have here. Thank you for joining us. Hi everyone, we (Michael and Emily) are new to the forum. 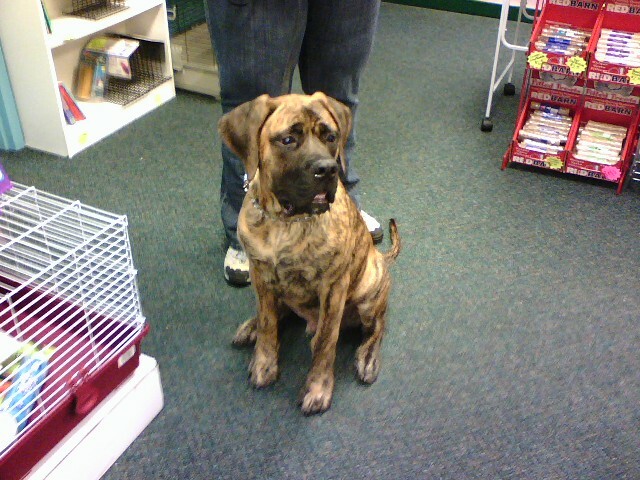 We have a 11 month old Brindle English Mastiff, his name is Tank. Tank is Emily's 1st pet ever!! lol Tank is my 3rd English Mastiff. I love this breed and find them to be great family members. Tank is a typical puppy, but has a bit of shyness starting with new people and we are working him through this as best we can. Any input is welcome. He is currently in intermediate obedience training and doing well. He like most Mastiffs has a lot of personality and is a great conversation piece I look forward to chatting/messaging with fellow owners and sharing tips and advice and stories and pictures with everyone. These are not current pictures i'll post more later. Have lots of fun here!!! 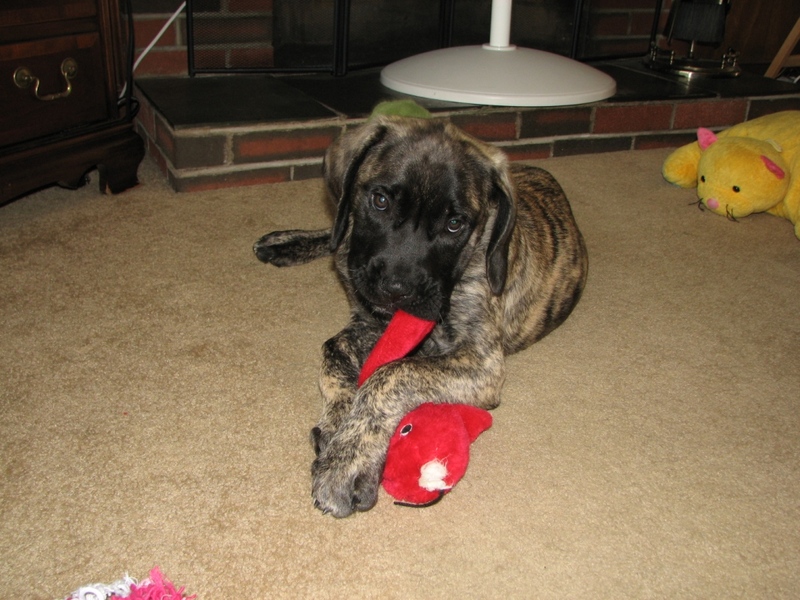 My name is Carrie and I've recently been adopted by an English Mastiff. 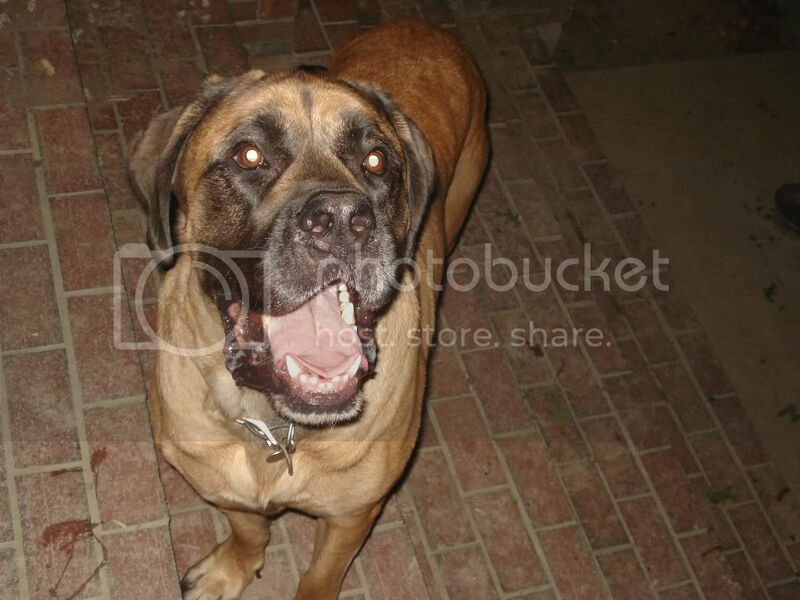 My neighbor's son had just started breeding Mastiffs when he got divorced. Consequently, most of the dogs wound up next door to me and when little Shandi showed up there needing a home... well, there was no way she was not going home with me. We have never had a puppy before (she's just about 11 weeks now) and we've never had a Mastiff before either so I'm looking for any and all advice from people that are experienced with this. Here are some pics of her and our 13 year old Lab, Daisy (poor Daisy keeps looking at me as if she's asking "When's this little beast going to go home?"). Hi everyone!!! My name is Kathy and I am the very proud owner of Murphy. He is just 6 months old and is sweet as pie. He shares his house with a Cavalier King Charles named Finnigan and a litter box trained, free roaming french lop named Misty. Oh, he has six human companions too. 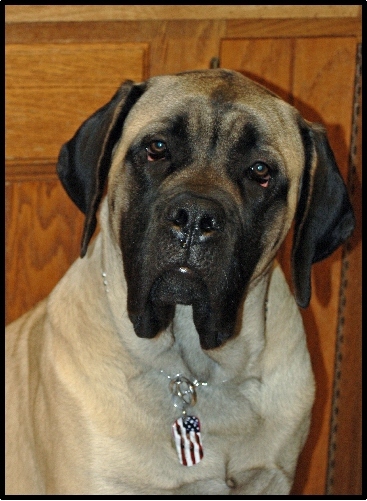 Look forward to chatting with everyone and learning some great tips on raising a lovable and gentle mastiff. Hi all! My name is Bronwyn. 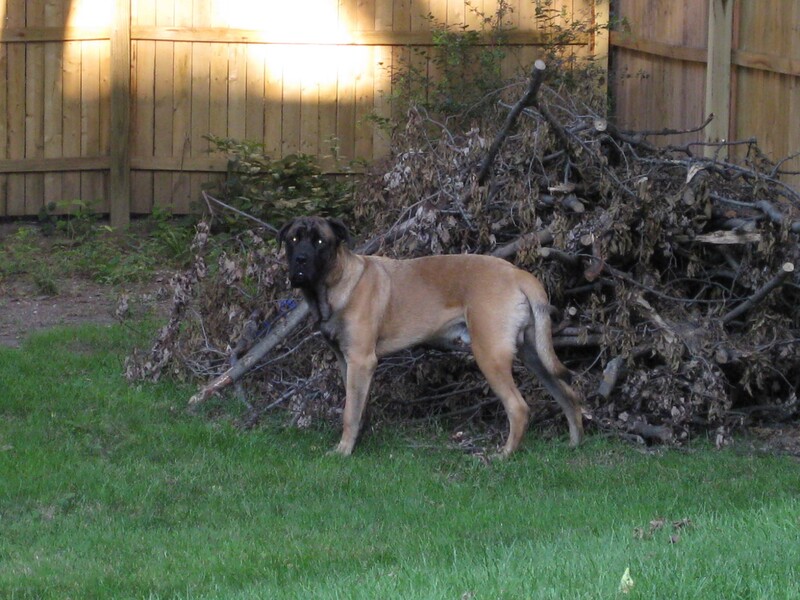 I have very recently acquired an english mastiff from a family that loved him but could no longer care for him. His name is Dunkin, he is 4 yrs old, AKC, underweight @ 140lbs, double ear infections (being treated) and an undescended testicle! Dunkin is sweet and gentle, shadows me wherever I go, plays fetch with the kids, and wrestles w/ hubby. Overall a great dog. I am looking forward to learning more about the breed and how to make him as happy as possible in his new home. I am a stay at home mom, but have been a dog groomer/trainer for seven years before going back to school for EMS. My hubby is in law enforcement w/ K9 experiance. We have three kids, age 10, 7 and 7 months. ~Anytime I see something screech across a room and latch onto someone's neck, and the guy screams and tries to get it off, I have to laugh, because what is that thing. Hi Everyone! My name is Susan and I also have to admit to being a lurker who wants to say thank you so much for being here sharing all your knowledge and stories. I have learned so much from everyone. Thanks especially to the newbies who are being brave and asking great questions and to everyone who is taking the time to help us get our pups on the path to good citizenship! My brand new babies are going on 9 weeks old. We got them on Sunday and I am amazed at how much they are growing everyday! Let me introduce Hennessy - apricot girl(doesn't she have the coolest little diamond on her forehead? It only shows when she's concentrating ) and Harley (sweet lover )- brindle boy!! Hi! My name is Andree, I live in South Florida and I am the proud owner of one of Linda Greeson/Maureen Cox pup from Samantha and Rogue litter, Turtle who will be 1 soon! 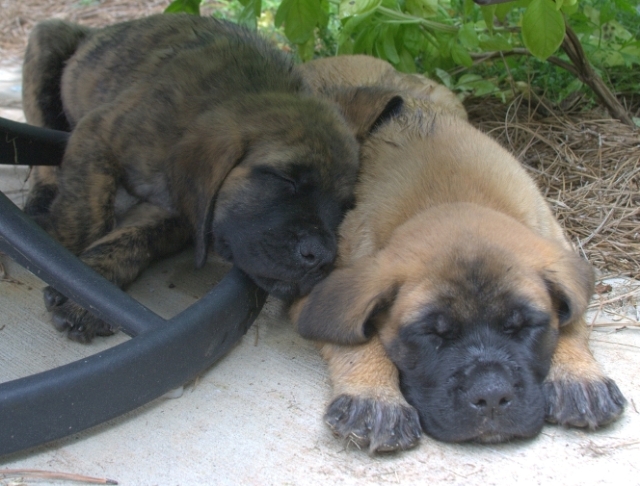 we am also a volunteer for the Southern State mastiff rescue. Turtle has one sister, Wasabi, a lab/rottie and a Foster sister Cheyanne, a 3 years old wonderful brindle girl that is looking for her forever family. Since getting our first masfiff a year ago, we are absolutely SOLD to the breed. There is none better. Our Turtle has the greatest temperament, a big mush who loves everyone and everything. Our Trainer even recommended that he becomes a Therapy dog! glad to meet you all. here are some pics. Hi, I've been lurking here for the last month or so and decided that it was time. My name is Carlos and I live in Oswego, Illinois (with wife and 2 kids). We fell in love with Mastiffs back in 96. 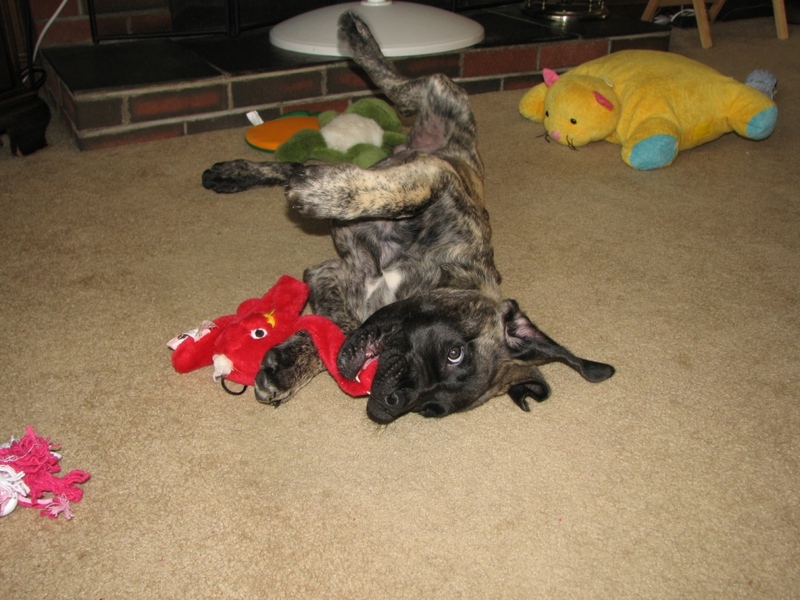 His name was Scooby (fawn puppy in the avatar with my daughter) and we soon realized after we got him home that we were Mastiff people for life. He was part of our life for 7 and a half years. We lost him to bone cancer and we still miss him. 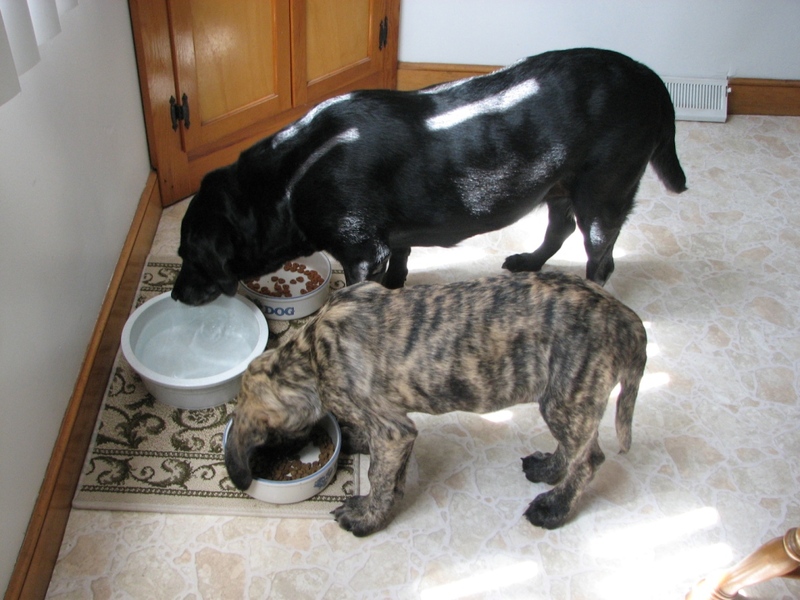 We also had a brindle male (Maximus) and we lost him a month and a half ago to Blastomycosis. This site has been like therapy for me as we miss Maximus very much. I am learning so much about this wonderful breed and I am very happy I found this forum. (Sorry this was so long). 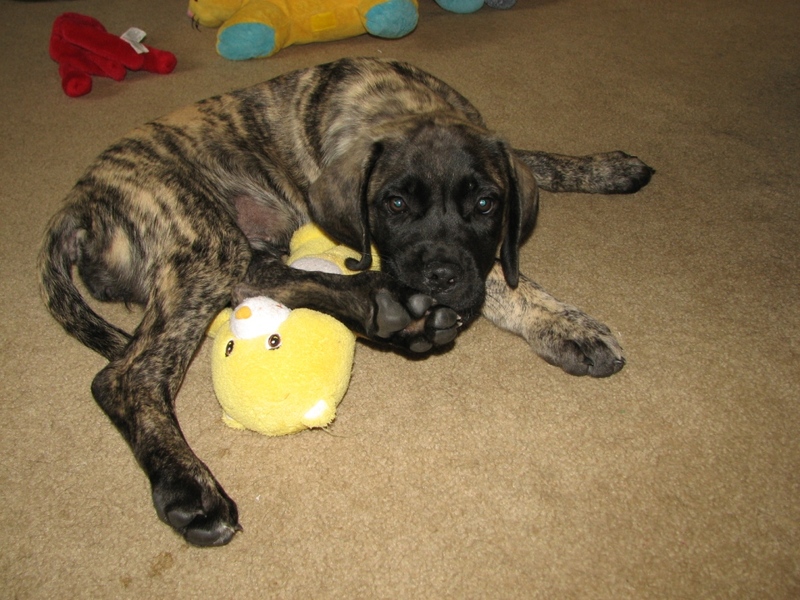 Hi everybody, I got my mastiff puppy about 3 months ago. This is my first giant breed and I'm loving it so far, I'm excited to see how big he will get. He is 5 months now and he is such a good dog! This is the best puppy I have ever seen and I love his personality. It seems like he gets bigger every single day .. although I think that is the truth. Hi. My name is Beth and I live in Northern California with my husband and 15 year-old son. I have been lurking and learning on this forum for about 2 months.In the past 6 weeks we have had to say goodbye to our 2 wonderful dogs. First was Jabba, our soul dog. He was a Mastiff/Newfoundland/Lab??? mix rescue boy who we lost to kidney failure and spinal degeneration. 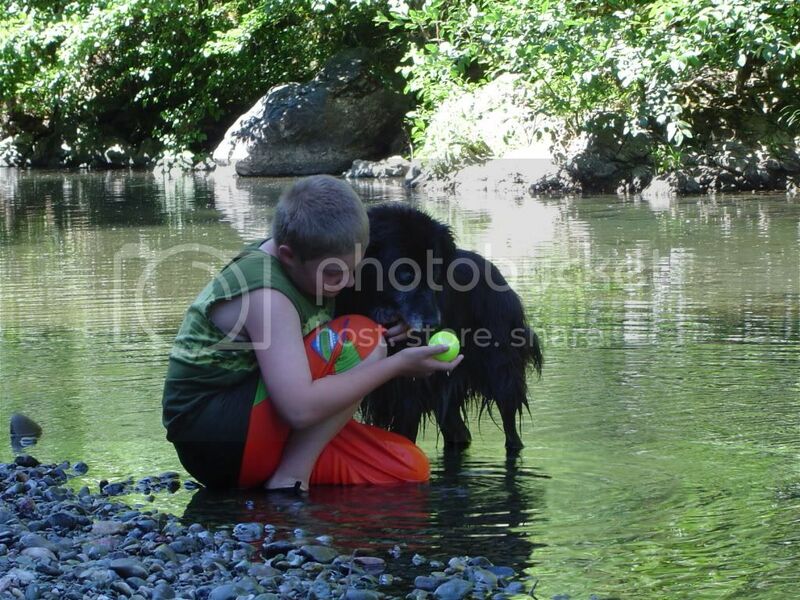 His sweet, loyal "big dog" personality shone through even after an early life of abuse and neglect. A few weeks later we lost our Isha, a golden/Keeshond mix. We had her from a pup she was almost 18 years old and she was a"sass monster" almost till the end. The house is so quiet and lonely but not for long! 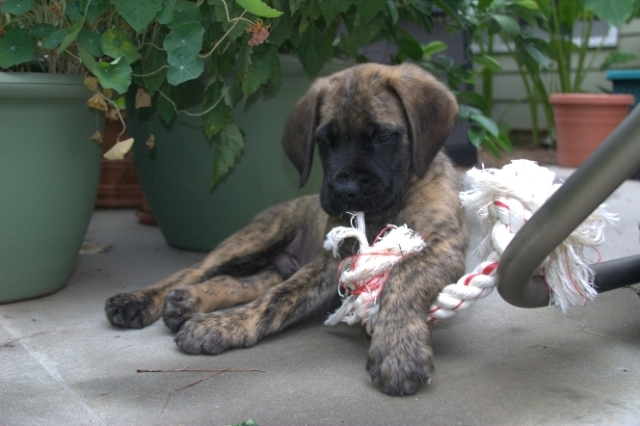 In 6 weeks we will finally be getting the Mastiff pup which we have been wanting for so long. We are so excited and since it has been almost 18 years since we have had a puppy in the house we are busy "puppy proofing," preparing and counting the days. We have been going to the shows and getting to "smooch on" so many beautiful mastiffs. We can't wait to have our own little(not for long) bundle of joy! Hi, I just joined the forum. My wife and I have a 10 month old Apricot English Mastiff. His name is Gus, he is the best dog I ever had and we are hoping to get another one for a playmate for Gus. Andree, I am so happy to see you on the board. Glad to see Turtle is doing well and has a new sister. It really is a year! WOW. I am getting pictures of all the pups and will post when I have all of them. Welcome to the board. hello, my name is Kristen and i own a fawn mastiff boy named Mr. hank he is 4 years old and is quite possibly one of the best loves of my life. I think my husband gets jealous sometimes haha.. when hank is bad and he gets mad at him i tell him not to be mean to him and that hank was here first! he just laughs at me.. We just bought a new house on 4 acres primarily for my boy and his girlfriend daisy who is a 2 year old bassethound. She is quite the attention hog but they are best friends. I am hoping to get hank a BIG girlfriend soon and have been doing a lot of research on the mastiff and want to pick one that comes from great lines. I also have a two year old little girl that came with some problems, she has turner syndrome but is coming along and doing pretty well. She loves hank and likes to use him as a pillow sometimes and give him treats anyways i look forward to meeting everyone and have already enjoyed reading about different things on the site! I never remember to read this thread and I just did and OMG hi to everyone and a big hello to Shawna and family!!!!! I just got back from a transport for rescue so am tired, but will read a bit more. Again hi to all the new people!! Well.. I guess since I've been posting, I should formally introduce myself. My name is Stephanie and I live in Cape Coral, FL. I am originally from Indiana and moved down here a little over two years ago. I am a nursing student with long days at school/hospital and longer nights with my nose in the books. I have two boys (human ones) ages 6 (Ian) and 2 (Alex). We also have a 10 year old Rottweiler named Kaymin. Kaymin is the eternal puppy. People that come over cannot believe he is 10. He is also definitely not a guard dog. All he wants is loves from anyone around. We also have a 4 year old Mastiff named Maizey. Maizey is the sweetest dog. She is so calm and relaxed and she loves to hold hands. She is terrified of strangers.. sometimes even people that aren't strangers, but she's sweet none the less. She is a very good dog. And then there is Toni, who you have all read about with her knot. She was named after Ian's favorite person in the world, Nascar driver Tony Stewart (I'm sure he would be so proud). She is 17 weeks old and I think she might be small (compared to some of the weights i've seen people posting. She is 48 lbs and 21 inches tall (floor to shoulders). We also have two gerbils (Tiny and Rocky) and some fish. 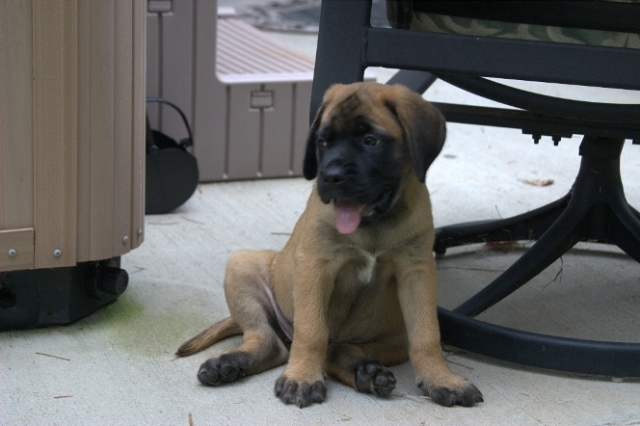 We decided to own Mastiffs after we lost the biggest black bear (Rottweiler), sweetest yet most insane dog ever. Skylar was "my" first dog. I had always had dogs growing up, but she was "mine". She's my "bug" till the day I die. I cannot imagine life without a dog (or three). They are so fun and every one has it's own personality and quirks. I love trying to figure them out... what they are thinking. Welcome everybody , but especially to my fairly new friend Kristen , who absolutly LOVE her big boy Hank!! will be receiving my very first mastiff in about a month (39 days to be exact...but who is counting haha) Anyways, I have been reviewing this website for several months now and I figured it was time I finally introduce myself. I am having a REALLY hard time deciding on a name for my future buddy. It is such a big decision and I just can’t find anything that I love. Any suggestions? I will be receiving a fawn male. Hello, new to the post! I have a 15 month old Italian Mastiff who is looking at a hip replacement in the near future. Wondering if anyone has any experience in this area as far as how successful these surgeries typically are, etc.. Also, I know that he will require 6-8 weeks of total crate confinement. I work full time 45 miles away from my home and am trying to figure out how I'm going to handle that situation. Anyone have any advice? Thanks so much for your help. Hi, My name is Traci I am a workers compensation account manager. I am new to the mastiff world. I have a 9 month old mastiff that has a severe heart condition. He is the love of my life. He has SAS (sub-Aortic Stenosis) which is in-operable. He takes medicine on a daily basis. My vet says that he probably will not live to be much more than a year old. He is still as playful as ever though. I contacted the breeder and he gave us a replacment puppy. He is 2 months old and a handful. You can tell he is healthy. The 9 month old slept alot at that age. So, now I have two giants!! I am having a hard time trying to find toys that do not get chewed up in seconds. If anyone can suggest toys that would be great because I do not want them to start chewing on my furniture because they have destroyed all of the toys. The 9 month old's name is Banjo and the 2 month old's name is Buddy. We love them dearly. I also have a bassett hound, her name is Mattie and a bassett/beagle, his name is Sam. I love my dogs!!!! Welcome newbies and thank you all for taking the time to tell us about yourselves.. it helps us to be more of a family here and to get to know each other better. And the pictures! We love the pictures!!! After a run like this my girl Abey will need a bath too! My name is Melissa, I live in TX and I don't know if I REALLY qualify to post on this forum (considering I don't have a full blooded Mastiff). I work in Insurance and attend college part-time. I am here because my dad, Jim Babinski, told me about it. 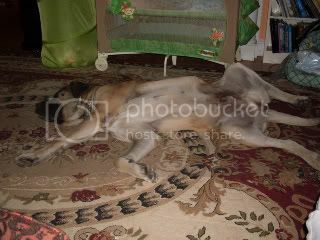 He has bred Mastiff's recently and post's on this forum. 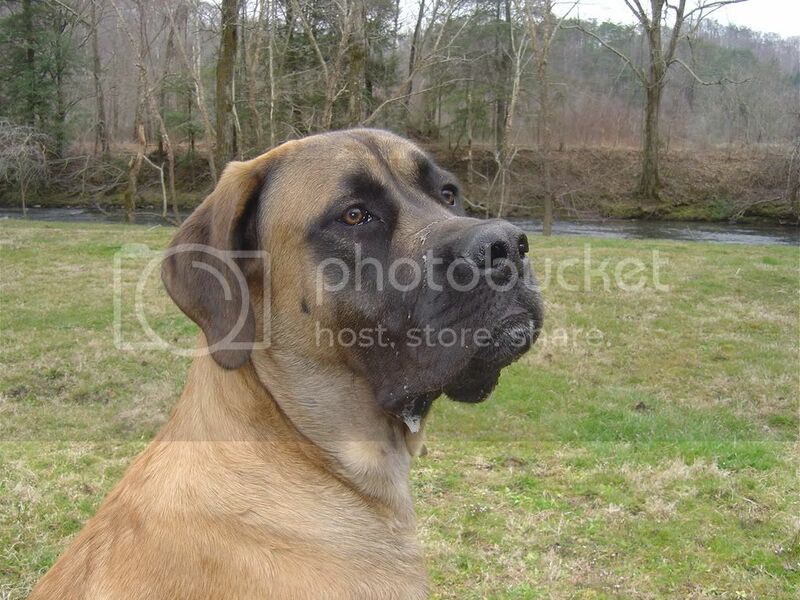 His mastiff's are gorgeous, I wish I could have one right now. I have 2 dogs, a 1yo Mastiff/Rotty mix, Cash. Also, a 6mon old Retriever/?? (terrier of some sort) mix, Brady. When we adopted Cash, we were told he was a Rotty/Retriever mix. Throughout his trips to the Vet during the first year, we were told he is definitely not Retriever, but Mastiff. He turned 1 on October 12th a few weeks ago, and he is around 100-110lbs, solid black with a white diamond on his chest. I thought that was big, from reading here today, it's NOT! My 6mon old Retriever just came home from the Vet's office with Parvo. We are very lucky that he was able to get better, but also upset because we cannot get anymore puppies, due to Parvo being in the house.But, I guess we won't live there forever!! I am married and have a 5 yr old son. We just moved into our first home a year ago. The first thing on our agenda when we moved in was, DOGS!!! 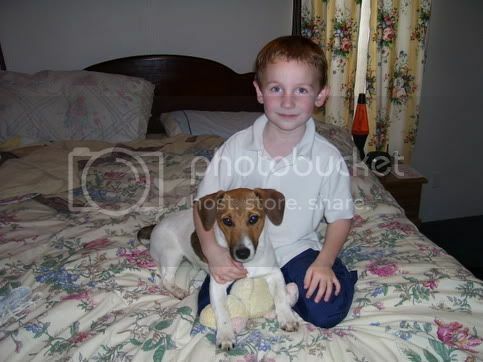 Our son had always wanted a puppy, we never had room considering we had always rented apartments. 1 month after moving in we had Cash, then 6 months later, Brady came. I am intrigued by these beautiful, big dogs and I would love to learn more about them. HELLO EVERYONE MY NAME IS TRISH I AM 30 YEARS OLD AND I LIVE IN BAYVILLE NJ. 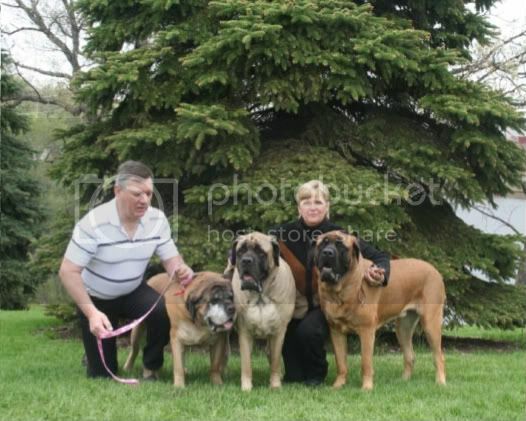 I HAVE OWNED MASTIFFS FOR OVER 10 YEARS AND I AM CURRENTLY OWNED BY 2 FEMALE ENGLISH MASTIFFS. I HAVE A 2 YEAR OLD FAWN NAMED MIKKA. SHE IS A MAMAS GIRL AND IS ALWAYS BY MY SIDE. SHE IS FULL OF ENERGY. REESE IS 1 YEAR OLD BRINDLE AND SHE CAN DESTROY A TOY IN 1 MIN FLAT (lol)SHE PREFERS TO LAY AROUND. I AM LOOKING TO PURCHASE AN APRICOT ASAP AND IF ANYONE KNOWS OF A GOOD BREEDER WHO HAS APRICOTS PLEASE LET ME KNOW. BOTH OF MY GIRLS HAVE PARTICIPATED IN BEGINNER AND INTERMEDIATE OBEDIENCE CLASSES AND WE WILL BE MOVING ON TO ADVANCED.HOPEFULLY WE CAN GET CERTIFIED AS CGC. I WOULD LOVE TO GET INVOLVED IN SHOWING, MAYBE W THE NEXT PUPPY. My name is Hillary I live in the Cincinnati area. I own 3 Mastiffs. 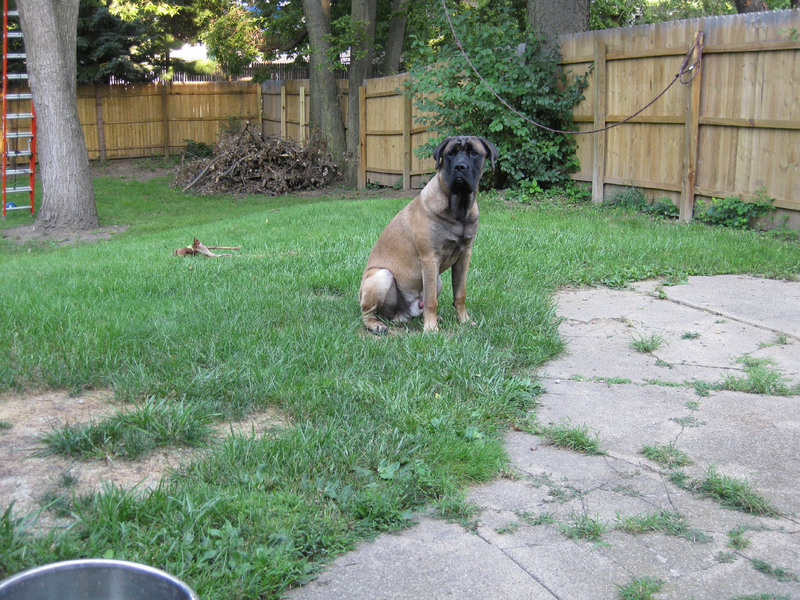 I have 2 yr old Brutus, an English Mastiff who i got from a breeder. 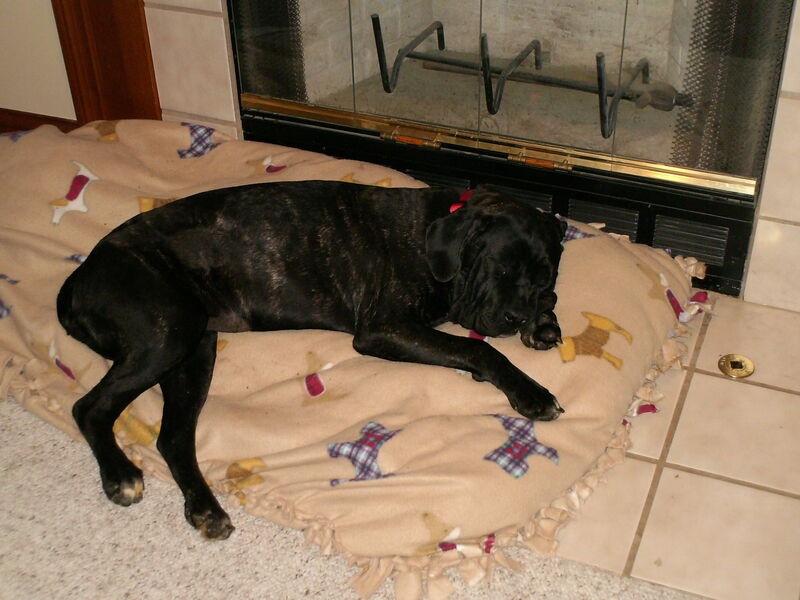 I have 1 yr old THE NIPPER, a CANE CORSO (Brazilian Mastiff) who was starved and put out as a puppy. I got her from a shelter but her growth was forever stunted, she is only about 70 pounds. My newest is Caesar a Mastiff/Pit Bull who I also got from a rescue, he is also under 1. I love them all and encourage everyone to rescue them whenever possible. 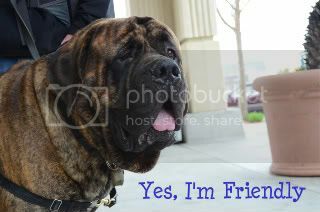 I am always willing to foster or babysit your mastiff too if you live in my area.